It is well understood that Account Based Marketing (ABM) has been around for sometime now yet not so well understood. Several companies have made good use of the same, yet most have shied away from proper utilization. 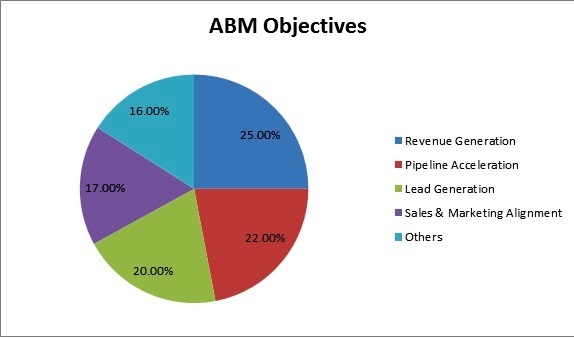 First of all it is important to simply understand what is ABM. It is the strategic integration between marketing and sales collaborate, recognize, target and convert business accounts. It is a business-to-business (B2B) approach. Instead of looking at everyone within the chain, it targets key personnel or clients that lead to the final decision making. Under this methodology, quality becomes more important than numbers. Extensive business research is conducted by the service agencies in order to provide personalized content. Responsibilities also differ depending on accounts and the marketers. Irrespective of that though, they all seek to build knowledge and executing the engagement plan through specific content. Business consulting firm Sirius Decisions has confirmed that the maximum people engaged in this field, are looking to connect with sales to define strategies and targets. Gathering of accounts or information, executing account plans, creating content and creation of online engagement plans are the other important tasks which respondents have alluded to. Working with external experts is least on the agenda of those surveyed by Sirius Decisions. Costs increase per lead or client as one goes higher up the pyramid. 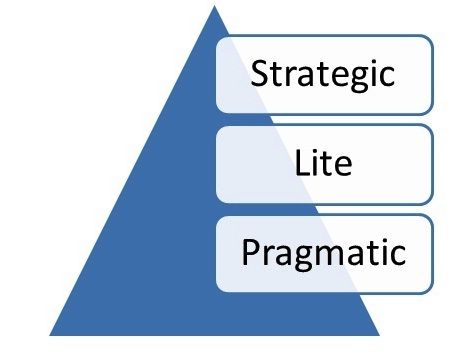 Pragmatic ABM is the approach where a single agency handles several clients. The approach is scattered. Lite ABM is where the marketer handles only a few selected clients. In Strategic ABM, as the name suggests, it is delivered by the very top. The said agency handles only a single key client. Needless to say, the final approach is not very common. ABM goes beyond prospecting for future business but also cross-sells and up-sells as required. A good example for this tendency can be Lion-bridge which provides localized translation services. Its Senior Manager Ms. Jessica Sousa clearly affirms that at Lions-bridge, the entire campaign is customer driven. Large accounts are selected and content plus campaign is completely overhauled to provide customized service. Business analysis provided to users by Kapost confirms that only a third of US marketers are investing in ABM as of now. 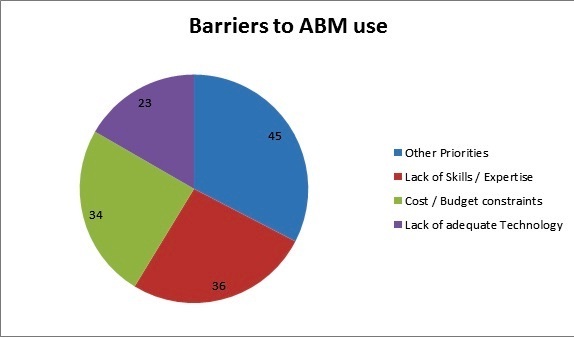 Less than half of those surveyed by Demand Gen Report confirm to presently having an ABM plan in motion. Even those who are using the same, majority have only had such implemented over the past two years but only a fourth using ABM for more than that time. The good progress is that the majority of those who aren’t using this approach do plan to launch the same over the next year and a half. Account Based Marketing has highly been influenced by the digitization now prevalent in most business aspects. Software platforms are automating a lot of traditional processes. Campaign management, customer segmentation and lead nurturing are all very important aspects of digital marketing now. This enables marketing via diverse set of channels. Only about a third of marketers polled however have confirmed that they are proud of their marketing automation tools being used. A similar proportion has affirmed positively regarding automation in CRM processes. Yet another similar number feels in both categories that the jump up is imminent. A majority is already using sales automation. Due to the alignment between technologies and marketing strategy, ABM has widely been held as a mar-tech initiative. In a study conducted, it was realized that just more than two-thirds of marketers polled said that technology greatly assists in scaling ABM operations. A larger number feels that adequate tools and templates must be developed to best facilitate the gains made. Covering more accounts is of importance to only twenty percent of those included in the survey. A minority even feels that ABM is one thing that cannot be automated and in fact a personal involvement is necessary to deliver the best of results. Only then will relationships between all parties be best appreciated. The ABM technique must best work with sales and data sources. Unfortunately sales teams have not been observed to be providing timely feedback or analysis to marketing. But a study conducted, it was observed that majority of marketers lauded the efforts of sales teams in correctly identifying accounts to be targeted. Account based leads are improving efficiency in terms of generating revenues, managing employee count and benefiting the overall industry. Several indicators have been identified which give in-depth business intelligence on the effective working of the ABM strategies adopted so far. It can pinpoint granular data on areas where improvements need be sought. A study conducted by Avention confirms that annual spend and length of relationship are the most important factors as observed by majority of respondents. Less important are frequency of purchase, estimated lifetime value and frequency of engagement. Location, talent recruitment and credit-worthiness figure least on the list in terms of importance attached by marketers themselves. Typically third party account information is tagged in such analysis. Predictive analytics as a tool has been oft ignored with only a fifth of respondents confirming that it is being used by them. However, a similar survey conducted this year has seen the numbers rise on both the counts. Forty four percent of B2B marketers now use third party account information while thirty percent of them are using predictive analytics. It breaks down data so that the key trends may be identified. The reliance on gut feeling can be minimized. Acquiring the right data is a major challenge for most organizations. Although amount of data available is enormous, not all of it will yield relevant statistics. Personalized content is now being preferred across industries. It can even be tailored for specific roles. This is where a specialized ABM agency can work wonders. Use of an external agency for curating content has gone up from a measly three percent just last year to a respectable twenty eight percent in 2016. Email is by and large the most common form to communicate this message. The system of tele-prospecting will grow at a slower pace with time. Instead account- based nurture will be the preferred option. Data vendors are now offering IP research in order to extract valuable business analytics. This particularly helps with tracking of engagement statistics. For smaller deals, ABM does not necessarily serve its purpose in terms of ROI. Very few US marketers have rated their ABM efforts as very effective. Many saw ABM as less important than other forms of marketing and a similar effort was being put to it. Interestingly a lot of marketers have confirmed that while they feel ABM will have delivered the adequate results, they are not fully convinced as proper metrics to measure have not been identified. Most such metrics are subjective. Thus overall we see that Account Based Marketing is certainly not just hype but actually pays if done correctly. It can play a vital role in improving marketing processes particularly its integration with sales.